Those in the know around these parts have probably seen Garcia Peoples a handful of times or more by now — they’ve maintained a hyperkinetic schedule of local and tour shows that would be the envy of any hungry young band. 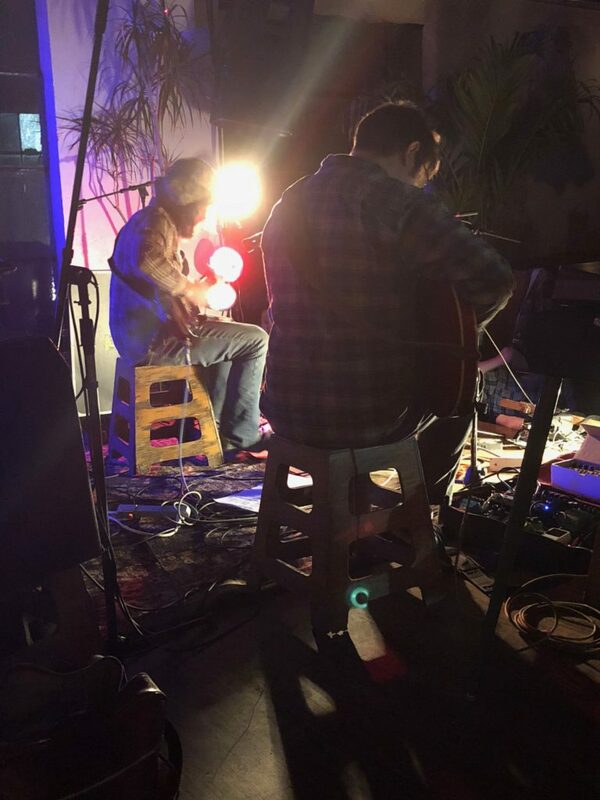 Listen to this set from Trans-Pecos a couple Sundays ago and you can understand why no promoter ever says no to these guys . This band is absolutely on fire right now, its players dialed in to a level that normally takes years. Being a private event, this was a “play what you want” set for the band, and they took that to heart, leading off with an extended improv that transitioned into their cover of “Laila Pt 2” by Agitation Free (which we first heard at Union Pool) followed by “High Noon Violence” from their brand-new breakout album, Natural Facts. 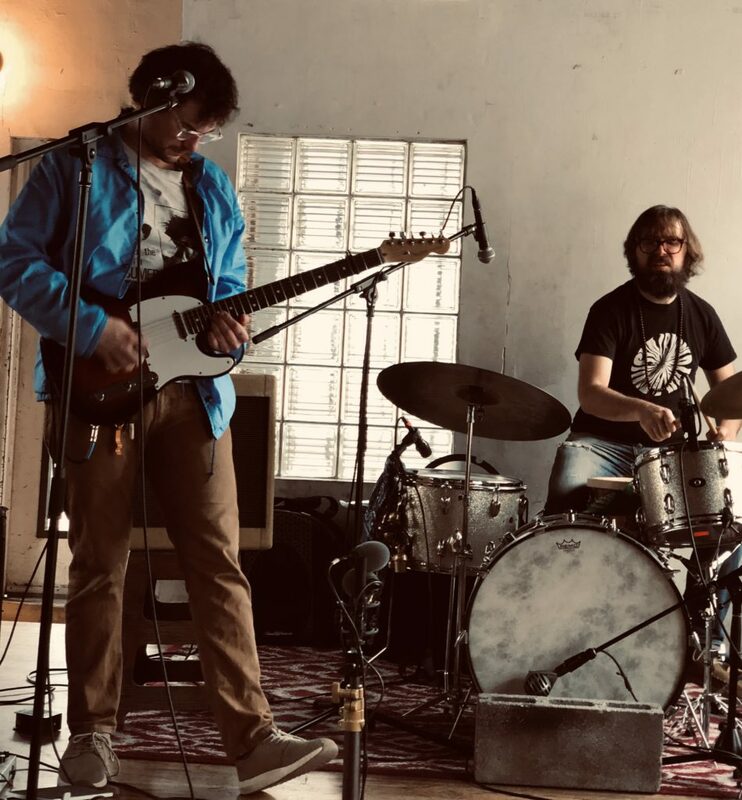 After a spot-on “Total Yang,” the band were joined by Ryley Walker for an extended 16-minute improv that found Walker joining Tom Malach and Danny Arakaki as a third guitarist. Adding to the special nature of the proceedings, the band was joined by semi-regular member Pat Gubler (aka P.G. Six) on keys. As the writer Jesse Jarnow memorably puts it, Garcia Peoples are “your heady, friendly reminder that it’s alright to let the sunshine in”. Arakaki, Malach, Derek Spaldo (bass) and Cesar Arakaki (drums) are after something here that’s so much more than being a Grateful Dead-referencing tribute band. In fact, their principal resemblance to a musician named Garcia is that each of these guys are skilled musicians with a hot improvisational streak, rarely playing a song the same way twice. Their sound lives in a zone all its own, and seems sure to cast a wide net far beyond the GD/Phish crowd. It’s no accident that they cover the likes of Agitation Free and Relatively Clean Rivers more frequently than, say, this alchemical rendition of “The Other One” with Chris Forsyth. So yes, New York-based heads will probably end up seeing Garcia Peoples whether they specifically plan to or not. But really, you ought to plan to. A band this good should be top of mind for anyone who cares about how the best live music should sound. I recorded this set with a soundboard feed and Schoeps MK5 cardiod microphones onstage. The sound quality is excellent. Enjoy! Back in the last decade when every sub-genre of music had a silly moniker, a particular type of intelligent polyrhythmic punk was clumsily called “math rock”. These days there aren’t really blogs around anymore to invent awkward genres in lieu of actually reviewing the music, but the descendants of the bands who got tagged as “math rock” are having a heyday of sorts. Boston’s Pile seems to be the granddaddy of this little movement, which also includes bands like Spirit of the Beehive, Palm, and Brooklyn’s Dodgeball. In the several weeks since this September show where the band exhibited the best traits of the current crop of mathies — strong sense of rhythm, challenging but rewarding melodic structure, and a great songcraft — Dodgeball released a new four-song EP, three tracks of which appear on this recording. The EP Turns Out I Was Just Really Bored continues the evolution of a band we expect to continue to grow in stature to the point where these cozy nights at Trans-Pecos will likely be a thing of the past. I recorded this set with the Schoeps capturing the onstage sound mixed with a solid board feed. The recording really captures the energy of the set quite well and we think it sounds great. Enjoy! This night from a couple of weeks ago at Trans-Pecos was Animal Flag’s local release show for their excellent album Void Ripper. This release represents a full two years of work since the Boston band’s last album and also saw a change in the band. No longer the solo project of singer/guitarist Matthew Politoski, Animal Flag is now a band with regular members. The familiarity with the material and with each other gave the band a tight and inspired approach to the music. The band worked straight through the new album (sans one track) before being called back and performing an encore. 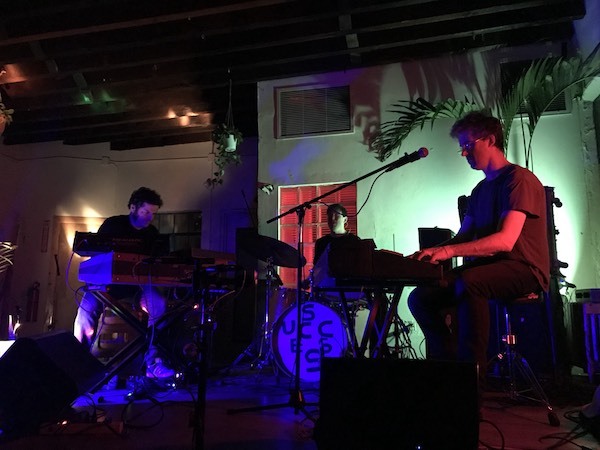 This well-attended and musically strong show created a really nice night for the band, fans, and venue and we expect it won’t be long before Animal Flag returns to Pecos. Animal Flag has a bunch of tour dates this Summer, including a show on cruise in NYC in August. I recorded this set with the Schoeps at the stage lip mixed with a fine feed from the soundboard mixed by talented FOH Denim Casimir. 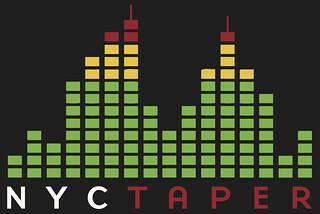 The resulting blend captures the strengths of both feeds and the sound quality is excellent. Enjoy! Oneida’s new album Romance is only a couple weeks away. In preparation, here’s a palette cleanser from Bobby and Kid doing their People of the North thing, with Barry London joining. The trio waste no time in locking into a late-night groove, and follow with forty-five minutes of pulsing organ, synth, and drum rhythms. 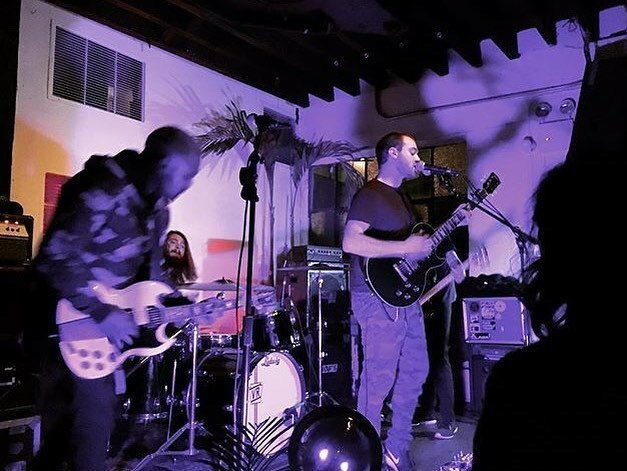 As Oneida has drifted back into playing more songs and less improvisation live, POTN has stepped in to scratch the itch for those less-structured performances. Hopefully you made it out Saturday night as these POTN shows aren’t all that frequent these days. 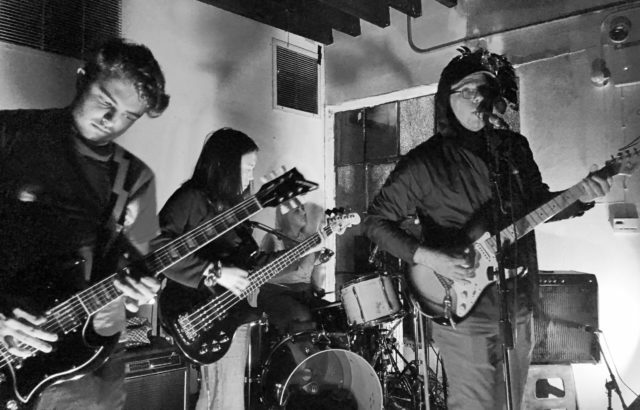 But whether you did or not be sure to come out next Saturday, March 3 as the mighty Oneida take the stage at Secret Project Robot to celebrate their new one and kick off some March tour dates. Word on the street is they’ll have those Joyful Noise VIP-only colored vinyl copies to make all your friends jealous. Recorded from the stage lip with MBHO cards in ORTF stereo. Board feed courtesy of Trans-Pecos FOH Imoni Cole-Palmer. 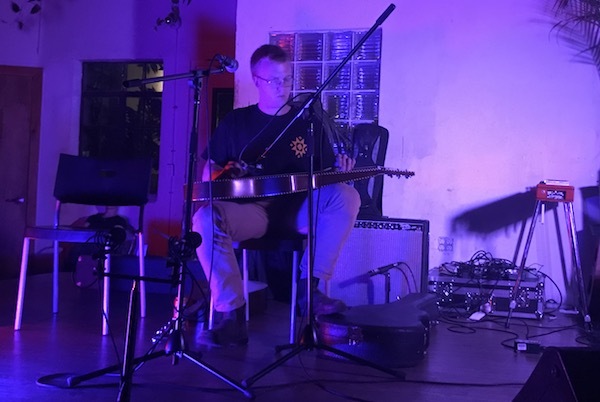 Chris Forsyth’s appearance at Trans-Pecos a couple months ago heralded that most important of musical happenings: the possibility of a new release. 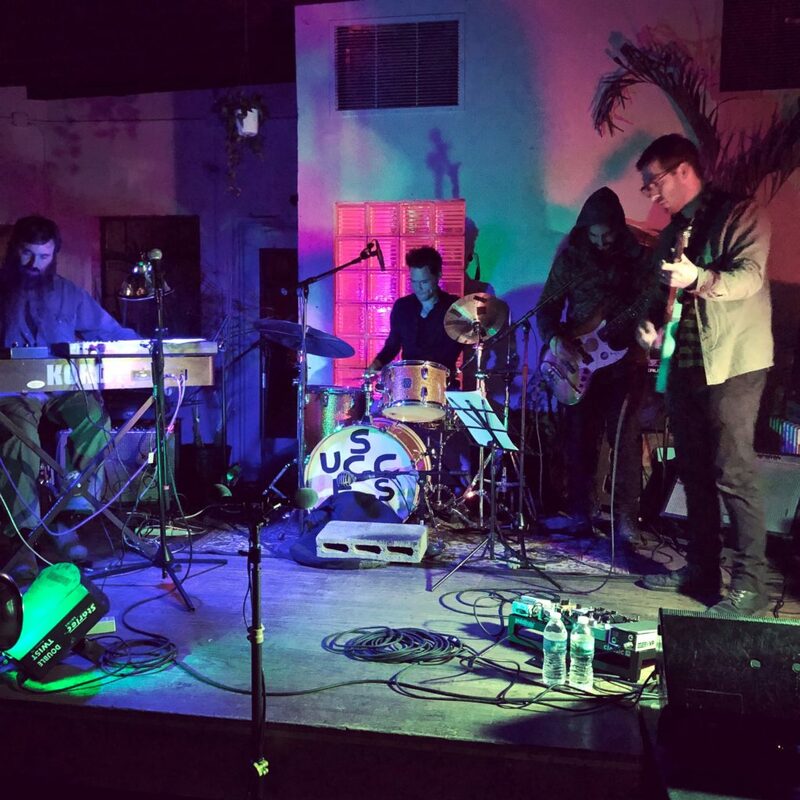 With their latest No Quarter release The Rarity of Experience a proven success win fans, Forsyth and the Solar Motel Band used this intimate stage to show off some of their latest attractions. After hitting the ground running with “High Castle Rock,” we heard three new numbers in a row, including “History and Science Fiction” and “Mistaken the Bottle” (which we first heard at Union Pool back in late 2016) plus a new as-yet-unnamed (to us, anyway) number. When you add in “Dreaming In the Non-Dream I-II,” you’ve got a set chock-full of new material that continues to expand on Forsyth’s unique guitar vision, which blends a rock fan’s appreciation for shredding (he named a song after “Cocksucker Blues,” after all) with a Deadhead’s appreciation for sonic exploration, thematic variation, and little details. It’s always a treat to see Chris and the band, and we’ll be sure to keep you posted on what’s next. I recorded this set with onstage Schoeps MK5 microphones into a warm-sounding Aerco preamp, plus a soundboard feed. The sound quality is excellent. Enjoy! Dave Harrington’s career as an exemplary musician is perhaps most well known through his Darkside duo with Nicholas Jaar, but in the last couple of years Harrington has excelled as a compiler of ad hoc super groups under the moniker “Merry Pranksters”. The band has performed at Rough Trade and multiple times at Nublu, but on Saturday night at Trans-Pecos Harrington pulled together another impressive group of performers in a benefit show for Builders Of The New World — an Actor’s Studio program to benefit homeless youth. On Saturday, the “special guest” for this version of the Merry Pranksters was Cibo Matto’s Miho Hatori, whose eerie vocals and keyboard work were featured prominently in the first half of the improvised number that began the set. Hatori’s work set the tone for the entire set, which was comprised of spacey atmospheric improv that occasionally reached inspired crescendos. The sextet was held together by a diverse rhythm section with Mauro Refosco on a variety of percussion instruments, Spencer Zahn on bass, and Harrington’s solo band’s drummer Samer Ghadry behind the kit. Lars Horntveth of the Norwegian prog fusion band Jaga Jazzist played a variety of horns and his contributions to this night were sublime and tasty. Harrington’s guitar work anchored the group and provided a significant amount of color to the mix. This was our first experience with Harrington’s Merry Pranksters, but I can guarantee it won’t be the last. This show was a benefit for The Builders of The New World: Education and Community Building Program for Homeless Children and At-Risk Youth in New York City. Donate [HERE], or donate through a download of this recording. All proceeds to this recording that are donated through Bandcamp will be forwarded directly to Builders of The New World. I recorded this set with the Schoeps cards at the stage lip and mixed with a board feed. The sound quality is quite excellent. Enjoy!